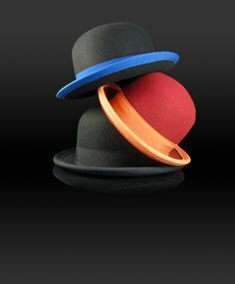 Juggling Hats – Manipulation Hats – Bowler Hats – Tall Top Hats. 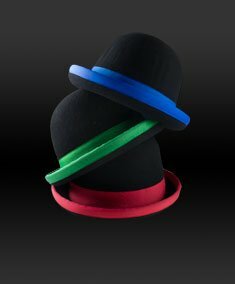 Manipulation, or juggling, hats are specially designed to help perform tricks and stand up to the beating such props will inevitably have to endure! 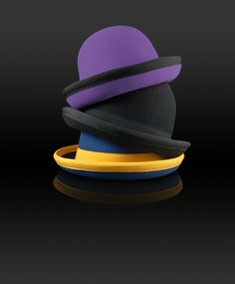 Made from thick, 3 ply felt the Nils Poll manipulation hats are flexible enough to take drops and aid body rolls and other moves but still stiff enough to retain their general shape. 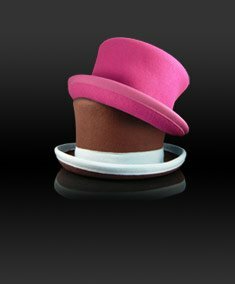 These hats come in a huge range of colours, sizes and shapes, including, round, bowler, derby, extra low, pork pie, top hats and extra tall top hats. The classic round Nills Poll juggling hat is often called bowler hat. 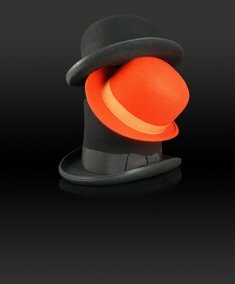 The round shape makes it ideal for catching the hat on your head as it doesn’t matter which way round it lands. The extra low variety of this hat is also great but makes arm, shoulder and chest rolls a little bit more difficult. 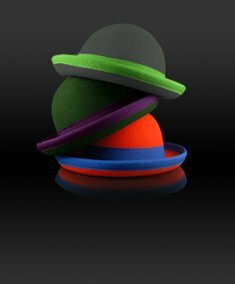 Juggle Dream have also created a juggling hat called the Tumbler. These hats are a bit cheaper than Nils Poll hats but are still an excellent product. The top hats are good for body rolls and make great fancy dress costumes as well. They tend to be cheaper than “proper” top hats you might find in a hat shop so if you want a mad hatter costume, these are a good bet. Plus you can bust out some tricks as well to impress your friends!